She purchased their stunning home back in 2017 so she could expand her family. 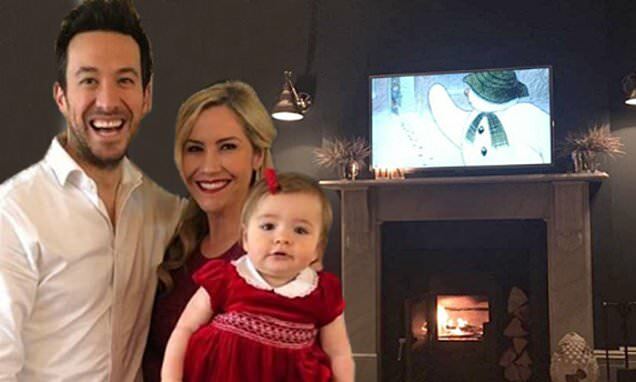 And Heidi Range has given fans a glimpse at the lavish abode she shares with husband Alex Partakis and their 11-month-old daughter Aurelia through an array of stunning social media posts. The Sugababes star, 35, cosy abode boasts lavish furnishings, including a statement marble fireplace with a chic neutral colour scheme running throughout the property. One of the standout features of the home is the sweeping staircase in the entryway of the abode, which provides the perfect photo taking spot and complements the wood panelled floors. A cosy living room is kitted out with cream chenille sofas angled so that the family can settle in and watch the large flat screen television positioned over the marble fireplace. The open-plan kitchen and dining area features a large medieval style wooden table positioned so that diners can look out into the patio and garden area. Heidi and her husband Alex purchased their home two years ago, and gushed that the timing of their pregnancy had been 'really special', as it aligned with the weekend she and Alex moved into their marital home. She previously told HELLO! : 'We moved into our house at Easter after spending two years renovating it and we think that was the same weekend we conceived. The singer added that she had hoped to conceive 'straight away', but confessed it took she expected.